Controversial plans to axe some benefit payments to disabled people living in care homes are being dropped. The government had planned to axe the "mobility" part of Disability Living Allowance - worth £51-a-week - for those in residential care. It had argued that local authority contracts with care homes should cover residents' mobility needs. But after much criticism from charities Work and Pensions Minister Maria Miller confirmed the plans have been dropped. In a written statement to MPs, she said the decision had been taken "having listened to the concerns raised" and the proposal would be removed from the Welfare Reform Bill. Up to 80,000 disabled people in care homes are thought to receive the mobility component of DLA. Chancellor George Osborne announced plans to axe it in last year's spending review, aimed at saving £135m by 2014-15. But it came in for heavy criticism from disability charities and campaigners - who said the payment was a lifeline for people which helped them visit family, friends and attend things like doctors appointments. Disability charity Scope had condemned the move as "callous". The government has since been reviewing the decision and two charities, Mencap and Leonard Cheshire Disability, asked Lord Low of Dalston to carry out a separate review. The Low Review, which reported back earlier this month, found "no evidence of overlap" between the support provided by the government, and that provided by local authorities and said axing the benefit for those in care homes would "deny people control over their own lives". Adam Penwarden of Turning Point, a health and social care provider, welcomed the news: "This benefit is integral to the lives of some of the most vulnerable members of our society, allowing them to access and be part of their local community. "The removal of this vital resource would have rendered many of them housebound, robbing them of the chance they would otherwise have to lead fulfilled and independent lives." I have always been clear that I would not make any change that would stop disabled people from getting out and about. Minister Ms Miller said the government had spent months researching the way the "mobility needs" of disabled people in care were being met. "We found a complex set of overlapping responsibilities have evolved which have allowed different local authorities to deal with the issue of funding of mobility in care homes in very different ways." She said there had been some practices "which have led to overlaps in funding" but added: "I have always been clear that I would not make any change that would stop disabled people from getting out and about. "Which is why after listening to the strong concerns of disabled people and their organisations, I have taken action and decided not to remove the payment." An amendment to the Welfare Reform Bill will implement the change. 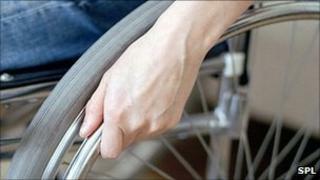 Labour's shadow minister for disabled people, Anne McGuire, said the government had "finally caved in to pressure". "Why they didn't do this earlier beggars belief as this has caused distress to those affected," she said. "We gave them the opportunity to do so by amending their plans in Parliament both in the Commons and the Lords, but they refused to budge." Richard Hawkes, chief executive of Scope, said the news was a "huge relief" but added that the charity had concerns about other welfare changes which "could push thousands of disabled families, already struggling to make ends meet, over the edge". The coalition plans to replace DLA, introduced in 1992 to help disabled people cope with the extra costs they face in their daily lives, with a new benefit called Personal Independence Payment. Mr Hawkes said: "Critical flaws in the assessment and an extended qualifying period mean there is no guarantee that the payment will go to the people that need it the most." Chief executive of Mencap, Mark Goldring said it was "fantastic news" that the mobility component of DLA would remain for those in residential care. "This is a positive example of the government listening to disabled people, who have been among the hardest hit by national and local authority budget cuts." But he said an "open and frank dialogue" must continue about other plans - including the replacement of DLA.